FIRST 5 HOURS ONLY £100! We provide driving lessons from total beginners with no experience through to learners who just require a few top up lessons to pass there test. You will be taught to an exceptionally high standard and we take great pride in our calm, friendly and professional approach to teaching. All our instructors are FULLY qualified and have passed strict tests set by the Driving Standards Agency. We cover all areas of Tameside as listed below and you will receive a door to door service or can be picked up/dropped off at your chosen place. We also offer intensive driving courses often known as crash courses where you take all your lessons in a short period of time and pass your test in as little as ONE WEEK. (Take a look at our testimonial page). To View our crash course site click here. 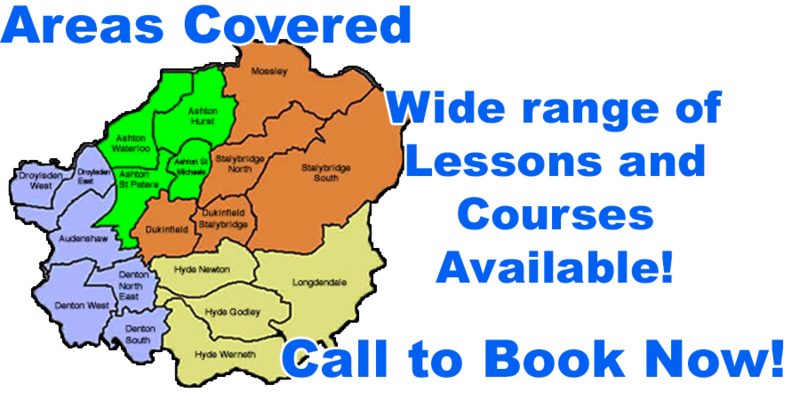 So if you want to get on the road to success with a popular and friendly driving instructor in Ashton Under Lyne, look no further and call today. Alternatively you can fill in the contact page and we will get back to you. Call now on 07961002461 or text driving lessons to 07961002461 and we will call you back.